5ft Life Size Teddy Bear wearing customizable Red Heart Happy Valentine’s Day shirt and choose your favorite fur color! Valentine’s Day is looking really special and VERY big with this great customizable gift from Giant Teddy. 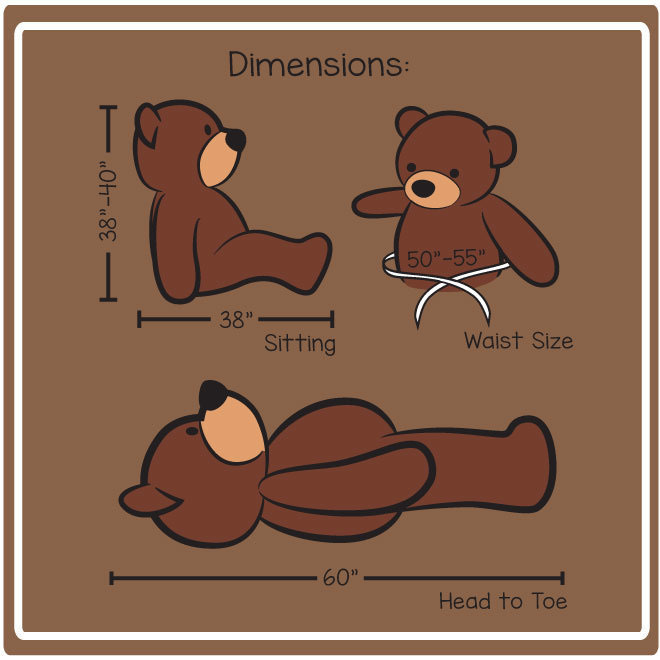 Our life size 5ft (60in) teddy bears are super soft and adorable, with huge huggable bodies in your choice of 7 fur colors. Your bear will come wearing our Happy Valentine’s Day red heart shirt personalized with one of our cute nicknames/phrases that you get to select. Your sweetheart will get the perfect gift you design just for them. Choose your Valentine’s favorite color! Please use the pull down menu to make your color selection before adding it to the cart. The shirt is specially designed for our 5ft (60in) teddy bears, is washable and removable, and is white featuring a big red heart design with the text “Happy Valentine’s Day” on it. Additionally, you can have one (1) of the following printed on the shirt underneath “Happy Valentine’s Day” – please use the pull down menu to select your choice.